Other comprehensive income is comprised of revenues, expenses, gains, and losses that, according to the GAAP and IFRS standardsIFRS StandardsIFRS standards are International Financial Reporting Standards (IFRS) that consist of a set of accounting rules that determine how transactions and other accounting events are required to be reported in financial statements. They are designed to maintain credibility and transparency in the financial world, are excluded from net income on the income statementIncome StatementThe Income Statement (or Statement of Profit and Loss) shows performance from operations of a business. The financial statement begins with revenues and. RevenuesSales RevenueSales revenue is the starting point of the income statement. Sales or revenue is the money earned from the company providing its goods or services, income, expenses, gains, and losses that are reported as other comprehensive income are only those that have not been realized yet. What’s included in Other Comprehensive Income? 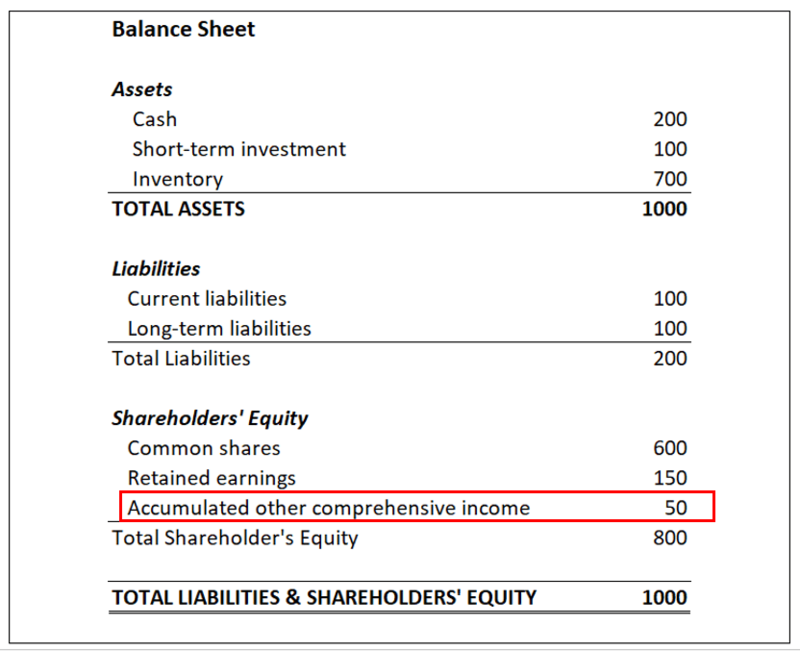 Other comprehensive income is shown on a company’s balance sheet. It is similar to retained earningsRetained EarningsThe Retained Earnings formula represents all accumulated net income netted by all dividends paid to shareholders. Retained Earnings are part of equity on the balance sheet and represent the portion of the business’s profits that are not distributed as dividends to shareholders but instead are reserved for reinvestment, which is impacted by net income, except it includes those items that are excluded from net income. This helps reduce the volatility of net income as the value of unrealized gains/losses moves up and down. According to accounting standards, other comprehensive income cannot be reported as part of a company’s net income and cannot be included in its income statement. Instead, the figures are reported as accumulated other comprehensive income under shareholders’ equityStockholders EquityStockholders Equity (also known as Shareholders Equity) is an account on a company's balance sheet that consists of share capital plus retained earnings. It also represents the residual value of assets minus liabilities. By rearranging the original accounting equation, we get Stockholders Equity = Assets – Liabilities on the company’s balance sheet. Only unrealized items can be claimed as other income. Once the transaction has been realized (e.g., the company’s investments have been sold), it must be removed from the company’s balance sheetBalance SheetThe balance sheet is one of the three fundamental financial statements. These statements are key to both financial modeling and accounting. The balance sheet displays the company’s total assets, and how these assets are financed, through either debt or equity. Assets = Liabilities + Equity and recognized as a realized gain/loss on the income statement. Other comprehensive income is a crucial financial analysisAnalysis of Financial StatementsHow to perform Analysis of Financial Statements. This guide will teach you to perform financial statement analysis of the income statement, balance sheet, and cash flow statement including margins, ratios, growth, liquiditiy, leverage, rates of return and profitability. See examples and step-by-step instruction metric for a more inclusive evaluation of a company’s earnings and overall profitability. While the income statement remains a primary indicator of the company’s profitability, other comprehensive income improves the reliability and transparency of financial reporting. The other income information cannot uncover the company’s day-to-day operations, but it can provide insight on other essential items. For example, an analyst can obtain insight regarding the management of the company’s investments. The reported investments’ unrealized gains/losses may forecast the company’s actual, realized gains or losses on its investments. Also, if a company runs overseas operations, the other income section can contribute to the understanding of the dynamics of the company’s foreign operations and assess the impact of foreign exchange fluctuations. Finally, it helps determine the extent to which company’s future pension liabilities may affect unrealized profits.